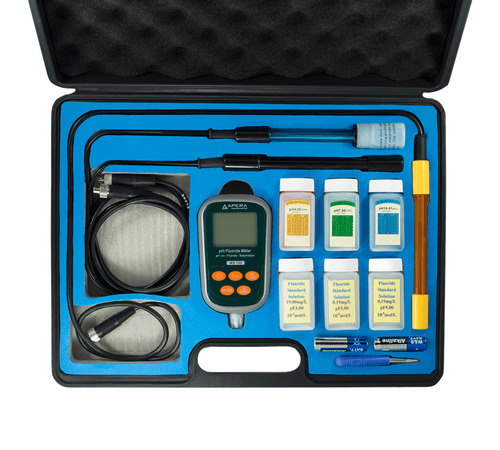 The WS200 Fluoride/pH/Conductivity 7-in-1 Portable Meter Kit is designed for accurate and reliable measurement of fluoride, pH, conductivity, salinity, TDS, resistivity, ORP (ORP probe sold separately), and temperature altogether. The patented 3-in-1 Fluoride Ion probe is composed of an ion electrode, a reference electrode, and a temperature electrode, generating reliable readings with stable potential and fast response rate. Range: 0.02 ppm to 1900 ppm; Accuracy: ±0.02 ppm, or ±5% of reading (whichever is greater). 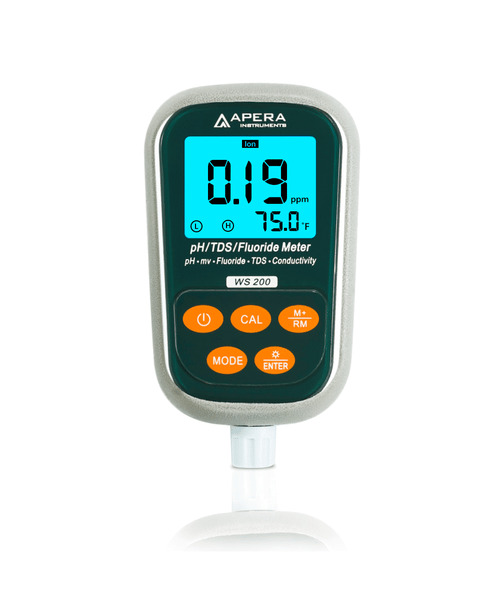 Intelligent Functions -- 2-point automatic calibration (0.19mg/L, 19.0 mg/L) for fluoride; 3-point automatic calibration for pH (4.00, 7.00, 10.01 pH) and 1-point calibration for conductivity; 800 groups of data storage (measurements, temperature, units of measurements); auto. power-off; backlight adjustment; Self-Diagnosis; Fluoride units switchable from mg/L, ppm, ppt, and pF. 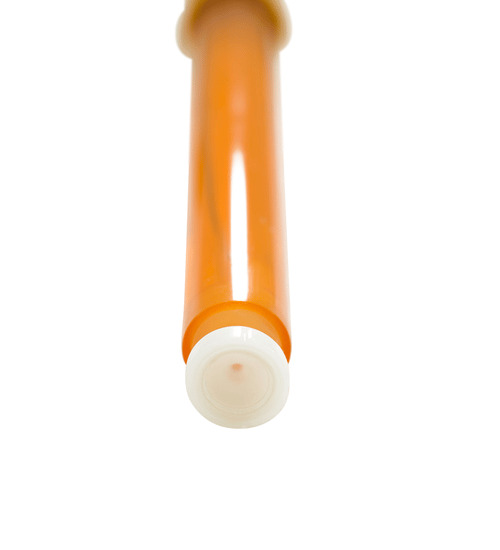 Convenient Use -- There is no need for probe stirring or added reagents during tests. You can directly measure your sample solutions' fluoride ion concentration just like pH test (only takes 10 minutes to activate the fluoride probe before tests). Rugged portable design with IP57 water resistant rating covered with a silicon case, which gives you a firm grip. Ideal for both lab and field use. What's in the kit - W2100 Meter*1, F501 3-in-1 Fluoride Probe*1, 201T-S Combination pH Electrode (ATC), 2301T-S Conductivity Probe (ATC), Fluoride Ion calibration solutions (0.19mg/L and 19.00mg/L, 50ml for each), pH calibration solutions (pH4.00, pH7.00, pH10.1, 50ml, one for each), conductivity calibration solution (1413μS/cm, 50ml), screw driver*1, back up batteries*3, instruction manual, and a portable case.